- Fashion Ecstasy on 二月 8, 2019. The last time I visited The Jade Lounge in Mandarin Oriental Hotel Taipei was when they collaborated with French pastry Michelin chef Gregory Doyen. and world renown skincare brand La Prairie to launch the white caviar afternoon tea set. I was lucky and so honored to meet Chef Doyen himself and had the pleasure to chat with him. Luxurious interior, and scrumptious food, the perfect experience is unforgettable. A year passed in the blink of an eye, but The Jade Lounge’s level remains top-notch! They served the best afternoon tea I have ever eaten! Again! For just $1950NT, guests can enjoy a heavenly champagne afternoon tea set, including savoury treats, English scones, a glass of champagne and a pot of select tea. Our champagne is Henriot Brut Souverain, our server fills our glasses to about one-third full. There is an extensive selection for teas and includes unlimited hot water refill, each tea is served in a pot. I choose the Dong Ding oolong tea, and our friend opts for a Taiwanese tea. We arrived at about 3:30 in the afternoon and there were no other guests in the restaurant, so we were lucky to get a window seat. The service of Mandarin Oriental is super fast, drinks are served in less than two minutes. Even the three-tier afternoon tea set is out in less than five minutes. Our server is fluent in English, she hears us speaking English and explains the menu in English with no problems. 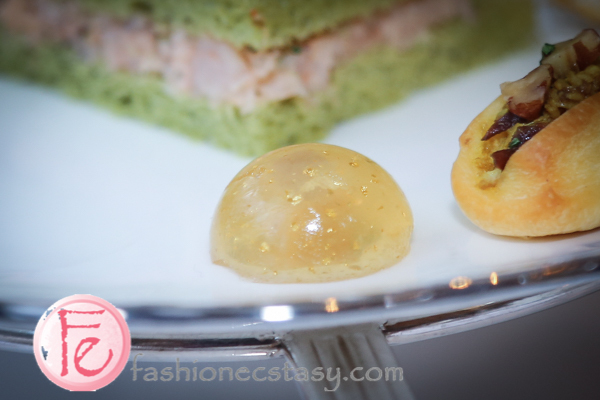 The bottom layer is a selection of savoury treats, including crab ball, curry chicken sandwich, shrimp sandwich, foie gras jelly, and tomato tart. The second and third layers are all desserts, which include matcha red bean cake, chestnut puff, caramel pear tower, sesame peanut cake, and kungfu tea dessert cup. The crab ball is made with real ingredients, besides having full of crab meat, there is no excessive cream or flour, making it not greasy at all, the ball is covered with corn flakes, which adds texture to the dish. The curry chicken sandwich is a mini sandwich with curry-flavored chicken and nuts. The curry soaks into the bread, but I think the dough can use a bit more of a crisp. 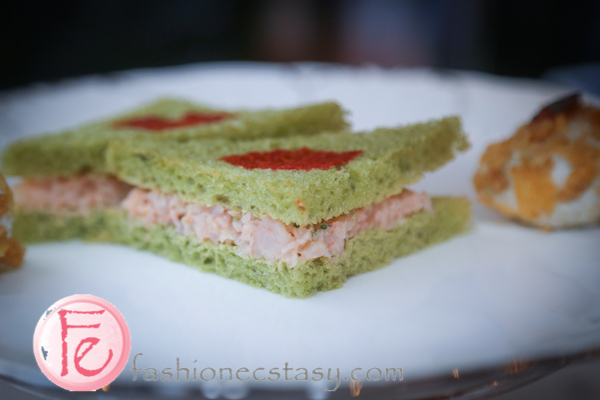 Shrimp sandwich is filled with chopped shrimps sandwiched soft matcha bread, full of seafood flavours. I’ve traveled across Europe, twice to Paris, yet the best foie gras I have had was in Mandarin Oriental Taipei’s Café Un Deux Trois. I came for the foie gras, but sadly the French restaurant Café has changed to a buffet-style all-you-can-eat restaurant serving international fare. 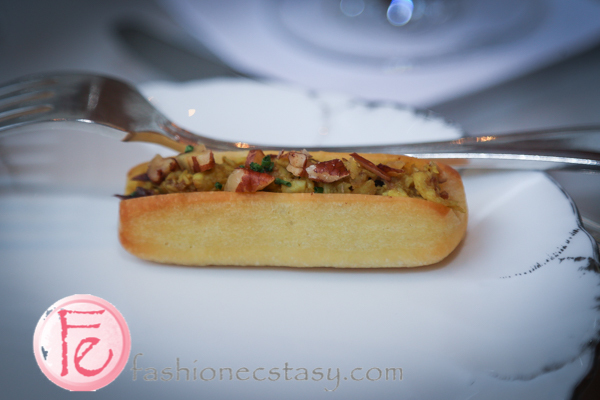 Although this foie gras is in jelly form and nothing compared to the pan-fried foie gras available before. It’s still unique. The jelly is filled with gold leaves, and the foie gras taste is still there, giving me my foie gras fix. 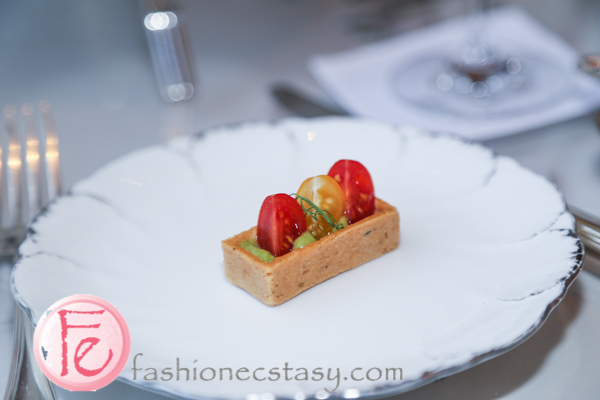 Tomato tart is filled with chopped baby red and yellow tomatoes and guacamole, garnished with a thin slice of curly spring onion, the taste is refreshing, this confection required extreme attention to details. I’m impressed with the chef’s skills. Green tea (matcha) cake is covered with matcha sugar, with green tea’s perfect match: red bean in the filling. The cake is moist and full of green tea flavour. This is a dessert made with caramel, pear, and custard. It’s on the sweeter side. 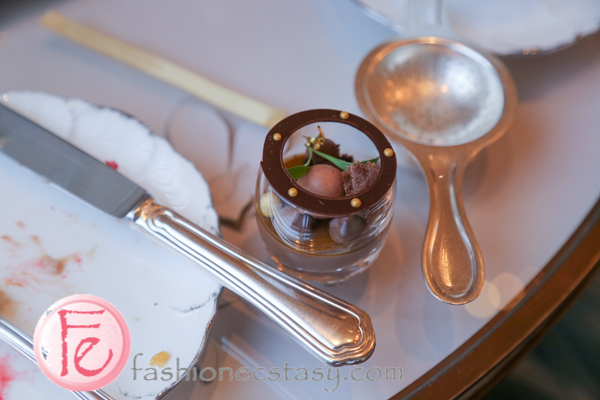 The chocolate-flavour looking dessert cup is, in fact, is cake and chocolate balls made with oolong tea. The yellow part is mango and passion fruit jelly, the presentation is gorgeous, resembling a plant. English scones are large in portion and include matcha and vanilla two flavors, served with Mandarin Oriental’s homemade orange jam, strawberry-rose jam, and cream. A year ago, my favourite restaurant for afternoon tea in Taipei was The Jade Lounge at Mandarin Oriental Taipei. A year later, The Jade Lounge is still serving the best afternoon tea I’ve ever tasted!